Toyota Japan has revealed the Hybrid variant of the 2015 Camry Facelift. In terms of design there is not much that differentiates the regular and the hybrid variants of the new Camry, only the ‘Hybrid Synergy’ badges and blue Toyota logo on the grille. Toyota India is expected to launch both the Camry Hybrid as well as the regular Camry facelift in 2015. The Camry Hybrid is expected to be priced about Rs. 1 Lakh over the current model which is priced at Rs. 29.13 Lakh ex-showroom Delhi. The interiors of the car are also the same as the ones shown on the 2015 Camry facelift showcased at the Moscow Motor Show in August 2014. The car does not get any changes under the hood, the Camry Hybrid will still be powered by a 202 BHP / 483 Nm hybrid system which consists of a 2.5-litre, 4-cylinder petrol engine and a 650 V electric motor generator. The Camry Hybrid does get a 8% increase in fuel-efficiency though, for the model sold in Japan. The model sold in India currently delivers 19.16 KMPL. Check out the details of the 2015 Toyota Camry below. Japanese car manufacturer Toyota has pulled the wraps off its latest venture, the 2015 Toyota Camry facelift, at the Moscow Motor Show this week. The Camry has several tweaks both on the inside and outside making it visually distinctive to its predecessor but that is not all; the 2015 Toyota Camry also gets a new engine lineup something which you do not see regularly in facelifts. 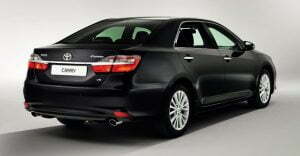 Now this variant of the Camry will be the global model, with India also included in the list of future destinations. But the one displayed at the New York Auto Expo will be exclusive to North America with minor changes to it. So let’s have a look what will the Toyota Camry look like 2015 onward. The official statement regarding the price is yet to come out but expect it to cost more than the Rs. 25-30 Lakh it does in India, by Rs. 1-1.5 Lakh at the least. 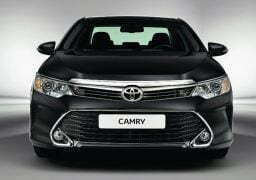 The 2015 Toyota Camry facelift gets a newly styled front fascia with a massive lower grille which not only stands out but also looks identical to the one found on the Corolla facelift. The thinner upper chromed grille is complemented by newly designed LED-infused headlamps. Also visible are the massive air intake and rectangular fog lights with chrome surrounds. At the back the sedan has re-sculpted bumper and a sleek looking chrome strip running across its width. Its flared wheel arches are filled by newly designed alloy wheels. 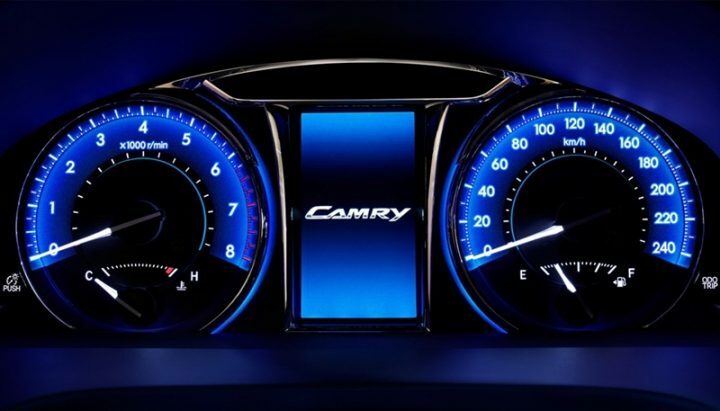 Inside the cabin, the Camry facelift gets a new backlit instrument panel and a 4.2-inch color TFT-display placed in the center. It also gets restyled multi-functional steering wheel while the centre console features a new 6.1-inch or 7.0-inch screen for the new multimedia system. The company has added a new base 2.0-litre 4-cylinder petrol engine that produces 150 BHP of peak power. Mated to a six-speed automatic transmission gearbox, this engine sprints to 0-100kmph in just 10.4 seconds. The other engines remain unchanged- a 181 BHP, 2.5-litre inline 4-cylinder and a 249 BHP, 3.5-litre V6 petrol engine. How do you like the 2015 Toyota Camry Facelift ? Let us know through the comment section below.